Vidyard found it difficult to track leads, lead responses, and lifecycle management in their CRM system. Marketing could not easily generate critical reports with existing data in Salesforce®, leading to a lack of insights and confidence in strategic decisions. Sales wanted to drive more pipeline from Business Development Reps (BDRs), as well as increase MQL>SAL and SAL>SQL rates, with limited change in investment. Executives could not identify segments of their business and funnel to prioritize in order to find low-hanging, high-impact growth opportunities. As a video marketing technology company, Vidyard had a sophisticated marketing tech stack. The marketing team was running multiple campaigns of various types, channels, and segmentations. The business generated thousands of leads in their CRM, Salesforce. However, Vidyard executives pushed the marketing team to drive growth. To even begin that effort, the marketing team needed to gain a true understanding of lead performance throughout the revenue lifecycle and how to be effective with their marketing. In essence, they needed the technology to make sense of the multiple data silos and make reporting easier to generate the actionable insights that would drive real revenue growth. Automated the tracking of leads and their progression throughout the funnel stages. Connected the revenue from deals to the marketing campaigns that influenced them. Established a single source of truth with marketing and sales data in the same place, instilling trust in the marketing data from sales and the executive teams. Created a powerful reporting infrastructure within Salesforce to easily generate reports, allowing the team to focus less on data quality and more on analysis and business insights. Marketing automation platform usage was a key indicator. Marketing automation platform (MAP) users had substantially higher MQL>SAL conversion rates compared to those lacking MAPs. The speed of SDR follow-up on MQLs matters! When MQL follow-up (by phone) occurred in under 60 minutes, the SAL>SQL rate almost doubled. Invest more in trade shows. While trade shows did not create a high quantity of immediate opportunities, Full Circle Campaign Attribution revealed that trade shows were very effective in influencing pipeline and accelerating revenue. Addressed MQL follow-up speed through SLAs, automated email notifications, and SDR time zone allocation, increasing SQL conversion rate by almost 50%. Implemented a strategy of focusing on MAP users, improving SAL volume and lowering cost-per-SAL (as well as downstream conversion rates). Utilizing Full Circle Response Management since the end of 2014, Vidyard achieved impressive growth. Vidyard’s funnel expanded dramatically and they grew their SDR and BDR team from three people to 25 in two years. Even with that growth, the organization maintains a high level of operational and cost efficiency. With the technology and power of Full Circle Response Management right inside of Salesforce, the sales and marketing teams created iterative and scalable revenue operations processes to maintain alignment around revenue growth strategy and tactics. 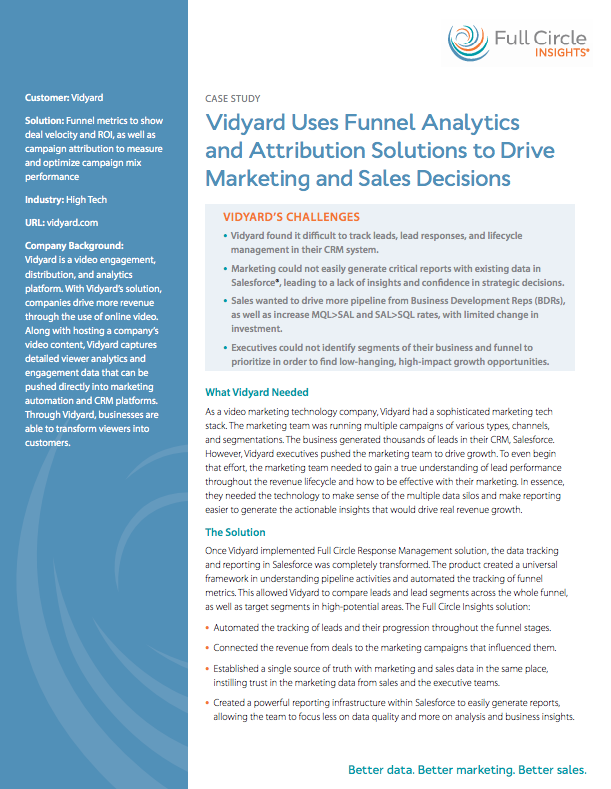 And because of comprehensive marketing insights providing full visibility into funnel health and marketing attribution, Vidyard shifted six-figure marketing spend away from underperforming activities and simultaneously doubled marketing ROI! Download the full Vidyard Case Study to learn how Full Circle enable Vidyard to scale business and double marketing ROI.